What Should You Do with Your Copies of The PLAIN TRUTH and The GOOD NEWS? You are very fortunate, indeed, if you have preserved all your copies of the PLAIN TRUTH and the GOOD NEWS. Many of you have not been able to do so, either because friends to whom you have loaned copies never returned them, or because you have not fully realized WHY you need to retain them. Beginning with the July numbers, a new policy has been adopted, which Mr. Armstrong explained in the last issue of the GOOD NEWS. 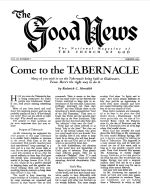 The GOOD NEWS becomes the national magazine of our church — the medium in print through which we can FEED THE FLOCK. The GOOD NEWS contains articles of special importance which you need to study and restudy constantly. Without back copies to which you can refer, you will not "be ready ALWAYS to give an answer to every man who asks you a reason" for the true faith that God has revealed to His church. By experience we know that unless you do restudy the articles you will gradually forget what you have read! The GOOD NEWS is also of immense help in teaching your children. It will encourage them to study the Bible. That is WHY you need to retain every copy. The PLAIN TRUTH is now the evangelistic magazine to the world. It is edited especially for the public, but you need to study its striking articles on prophecy, general Christian living and doctrine. Although you must NOT give or loan copies of The GOOD NEWS, because people may become offended by the "strong meat," you should feel free to give or loan copies of The PLAIN TRUTH to sincerely interested friends. If your copy is not returned to you, be sure to write us for another copy so you will have a complete file of all issues of The PLAIN TRUTH. The most satisfactory method of preserving the magazines is to buy a binder in which you can insert each new issue. You can punch two or three holes in the margin of each copy, according to the style binder you purchase. When you want to study any particular number, you can easily remove it. So be sure, from now on, to preserve every copy of both magazines!